Conceptual rendering of space shuttle Enterprise as it will be displayed on the flight deck of the Intrepid Sea, Air & Space Museum in the summer of 2012. 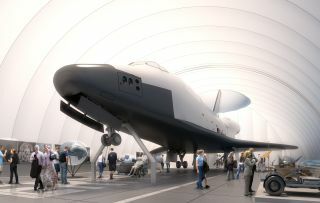 NASA's space shuttle Enterprise, which never flew in space but did pave the way for the United States' historic 30-year shuttle program, will arrive in New York City on April 23, local space museum officials announced Thursday (March 1). The prototype orbiter's arrival in the Big Apple will start its journey to a new display at the Intrepid Sea, Air and Space Museum, a converted World War II aircraft carrier-turned-museum complex. Enterprise, which since 2003 has been on display at the Smithsonian National Air and Space Museum's Steven F. Udvar-Hazy Center in Virginia, will be flown atop NASA's shuttle carrier aircraft, a Boeing 747, from Dulles Airport to John F. Kennedy International Airport in New York City. Weather permitting, the ferry flight will come less than a week after NASA's most-flown shuttle, Discovery, arrives at the Udvar-Hazy Center to take Enterprise's place within the Smithsonian's collection. "We are immensely excited about Enterprise's landing at JFK, and are readying the Intrepid for her arrival," Susan Marenoff-Zausner, museum president, stated. "Introducing Enterprise to New York is a landmark occasion." The Space Shuttle prototype Enterprise flies free of NASA's 747 Shuttle Carrier Aircraft (SCA) during one of five free flights carried out at the Dryden Flight Research Facility, Edwards, California in 1977 as part of the Shuttle program's Approach and Landing Tests (ALT). Enterprise's final flight to New York will be the first time it has been in the air since it was flown to the Smithsonian in 1985. For the past two years, NASA shuttle technicians have inspected and prepared the orbiter to make sure it was ready for the trip from Washington, D.C., to New York City. The flight will mark a reunion with NASA 905, the modified Boeing 747 carrier aircraft, which first flew Enterprise for a series of atmospheric approach and landing tests in the late 1970s. The tests proved the reusable winged space shuttles could return to Earth as a glider. Enterprise will stay about two months at the airport before being loaded onto a barge and shipped to the Intrepid. On its way down the Hudson River, it will pass by New York landmarks, including the Statue of Liberty and the site of the World Trade Center. "When the Enterprise touches down at JFK Airport, it will signify the first step of its final journey to educate and inspire millions of people around the world about the groundbreaking work of the NASA space program," said U.S. Senator Chuck Schumer (D-NY). "Once it lands next month, the Enterprise will immediately become an iconic and must-see destination in New York." A model of the space shuttle Enterprise is seen in the foreground as NASA Deputy Administrator Lori Garver speaks during a ceremony celebrating NASA’s transfer of title and ownership of the space shuttle Enterprise to the Intrepid Sea, Air & Space Museum on Sunday, Dec. 11, 2011 at the museum in New York City. The transfer is the first step toward Intrepid receiving Enterprise in the spring of 2012. Once at the Intrepid, Enterprise will be lifted off the barge by crane and placed onto the aircraft carrier's flight deck where it'll be on exhibit to the public starting this summer. To protect the orbiter from the elements, the Intrepid will erect a temporary, climate-controlled steel and fabric tent that will cover Enterprise. According to the museum, the pavilion will feature "innovative elements in an exciting and immersive experience for visitors." The flight deck display will give visitors the chance to see Enterprise until a permanent exhibition hall can be built. The Intrepid is advancing on its plans for a new facility to be located across the street from the aircraft carrier to showcase the shuttle and enhance the museum's space related exhibits and educational displays. The proposed $85 million facility is planned to reside on what is now an empty lot owned by the state. NASA awarded space shuttle Enterprise to the Intrepid in April 2011 when it also selected the display sites for its three space-flown orbiters. In addition to giving Discovery to the Smithsonian, the agency assigned Endeavour to the California Science Center in Los Angeles and retained Atlantis for its own visitor complex at the Kennedy Space Center in Florida. NASA signed over ownership of Enterprise to the Intrepid Sea, Air & Space Museum last November. The museum held a ceremony celebrating the title transfer the following month with state and space agency officials present. "The arrival of Enterprise is a monumental occasion for all of us," said Intrepid's co-chairmen, Charles de Gunzburg and Richard Santulli, in a statement. "Not only can we marvel at her greatness firsthand, but she will enrich the city of New York, its inhabitants, and millions of visitors from around the world."